There are many ways to prepare for the GMAT, from self-study to tutoring to classes to online options. Let’s first compare the pros and cons of the different options, then rank the options from a cost-benefit perspective, and finally discuss each option in more depth. For each preparation option, we will provide some suggestions on what to look for when evaluating specific offerings. Keep in mind that quality of the instructor is one of the critical considerations for most of these preparation methods. You probably have limited time to study for the GMAT, given work and other commitments and the time required for business school applications. Therefore, you should carefully think through which preparation option would be most effective given your availability. If you fail to adequately prepare before taking the GMAT, you may need to retake the GMAT and invest significantly more time to prepare a second time. The cost of some preparation options may seem hefty, but the cost is insubstantial in the long run. Effective GMAT preparation should help you achieve a higher GMAT score, directly impacting which MBA program you are ultimately able to attend. As you can see on our chart of the Top U.S. Business Schools, there is a clear correlation among median GMAT score, school ranking, and post-graduate salary. So which option is best? That will depend on your personal circumstances. We have provided an overview of the pros and cons of the different options, and you can decide how these are applicable to your situation. For example, the enhanced interaction that is possible with in-person tutoring or classes can be beneficial in your GMAT preparation, and therefore we would rank in-person preparation options slightly higher. For many people, however, the convenience afforded by online preparation options is more important and valuable. Although the least expensive option, self-study is not very effective for most students. There is a tremendous amount of material to learn for the GMAT. Furthermore, GMAT questions often incorporate the math and verbal concepts in a subtle manner, essentially testing your critical thinking skills rather than your knowledge of certain formulas. According to GMAC data, students who scored in the 600s and 700s spent an average of 92 and 102 hours, respectively, preparing for the GMAT. You want to make the most productive use of your study time, not waste valuable time studying in a haphazard manner, approaching problems inefficiently, repeating mistakes, and developing bad study habits. You can learn concepts from a book, but with self-study, you won’t have someone to develop a study plan for you, show you how to solve problems efficiently, point out your mistakes, offer immediate corrective suggestions, answer your questions, fill in knowledge gaps, and keep your studying on track. A skilled tutor or instructor can help you with all of this and much more. Self-study works best primarily for advanced students who have lots of self-discipline. You will need good study guides to help you progress through the concepts. Good study guides should be high-quality and error-free, offer a thorough discussion of relevant GMAT content and strategies without delving into irrelevant material, contain quality practice questions with detailed explanations, and be structured towards self-study. Although there are many study guides available (we have seen them all), unfortunately there are very few that we think are worthwhile. Manhattan GMAT offers a complete set of ten core study guides that, although far from perfect, are the best self-study GMAT preparation guides available. Interestingly, Manhattan GMAT doesn’t use these books in its classes – its students must study these guides on their own. You can purchase either the entire set or individual books as needed. Purchasing one or more of the ten core study guides gives you access to six online computer adaptive tests. Three supplemental study guides accompany the ten core guides. The biggest downsides are the cost of 13 separate books and the time commitment involved in going through over 3,000 pages of content (although not everyone will need all 13 books). Kaplan Premier for math / RC / IR / AWA + Manhattan GMAT's Sentence Correction and Critical Reasoning books. The Kaplan Premier book falls far short in terms of verbal content, but is acceptable for non-advanced math content and comes with five online computer adaptive tests. This combination is best for students who are not necessarily aiming for a top score and who don’t want to invest the time and money required for all the Manhattan GMAT books.. In addition to study guides, we consider it mandatory to use the Official Guides published by the GMAC. Although these books lack detailed content review, the Official Guides are the best source for practice questions because they are the only books with retired real GMAT questions. Since there is no overlap in practice questions, we recommend that you purchase all three books. To save money, you can purchase the books together in the Official Guide Bundle . In-person tutoring is the most effective way to prepare for the GMAT. With personal tutoring, a highly-skilled GMAT instructor teaches the material to you, customized to your specific needs and learning style. Furthermore, a good tutor can help you develop a focused study plan, immediately offer corrective suggestions as you work through problems, and keep your studying on track. This is particularly important for students struggling to improve their GMAT score (in practice diagnostic tests or from a prior GMAT administration). Finally, you can set up a flexible meeting schedule with your tutor that suits your availability. The biggest disadvantage to tutoring is cost. In order to limit the hours and corresponding cost, many students use tutoring to supplement self-study or another preparation method. You deserve a top-quality GMAT tutor. But since this a subjective, difficult-to-measure criterion, you can focus on two objective statistics: minimum GMAT score and tutor pay rates. A tutor who achieved a 99% (760+) score on the GMAT should be able to understand and effortlessly explain any GMAT concept to you. Furthermore, the best tutors will naturally gravitate to the companies that offer the best compensation. Ideally a company should also offer hourly tutoring, so that you can get however many hours you need or try tutoring out without having to commit upfront to a package. For more recommendations on how to select a tutor, please see our Tutoring Comparisons page. Technological advances have made online tutoring a great alternative to in-person tutoring. More interaction is possible with in-person tutoring, and therefore we rank this option slightly higher than online tutoring. That said, online tutoring significantly expands your options in selecting a tutor. It will be much more beneficial for you to work online with a tutor that has fantastic credentials and experience than in-person with whoever is geographically nearby. Unless you can meet in-person with a top-notch GMAT tutor, find the best tutor online. One clear benefit of online tutoring is that there is no need to commute to a physical location in order to meet your tutor. You meet your tutor online from the convenience of your home or office. This is particularly beneficial because in-person tutoring is often held at a potentially-noisy location such as a bookstore or quick-service restaurant. Online tutoring requires more advance preparation and coordination than in-person tutoring, but most of this burden falls on the tutor. As a student, you must compile in advance any questions that you want to review with your tutor. This will generally entail making a list of questions from the Official Guides or other books, and capturing screenshots of questions from diagnostic tests such as GMATPrep. Your tutor should incorporate these questions into a lesson plan that he or she uploads into your online platform in advance of your tutoring session. To receive maximum benefit from online tutoring, select a tutoring company that has invested in a top-notch online learning platform, as GMAT Genius has done. This platform should include an interactive whiteboard so that you and your tutor can work through questions together, presentation capabilities so that your tutor can upload questions in advance, and application sharing so that you can review computer-based diagnostics with your tutor. In addition, the platform should have session recording capabilities, so that you can review tutoring sessions anytime. Since the technology is critical to successful online tutoring, we suggest that you avoid tutoring via phone, Skype, and inferior online platforms. If fact, we suggest that you completely avoid any test preparation company or tutor that even offers phone or Skype tutoring, because such companies do not have your best interests at heart. In addition to technology considerations, also keep in mind the factors relevant to selecting an in-person tutor, as discussed on our Tutoring Comparisons page. Full-length courses typically run six to nine weeks, with one or two weekly class meetings (typically three hours each). A full-length GMAT course is a good alternative to in-person tutoring. Although courses follow a set lesson plan and are not customized to your specific needs, full-length courses systematically cover all the material and allow for a reasonable amount of interaction with the instructor. You can easily ask questions to and solicit feedback from your instructor. Instructors can come up with additional explanations and show different methods as necessary. As the course progresses, your instructor will get to know you and can provide personalized advice. 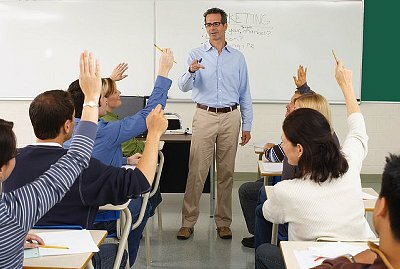 Furthermore, a good instructor will vary the class pacing according to student needs, based on his/her observations and student feedback. Finally, the physical classroom setting limits distractions and is conducive to learning, and the set class schedule helps keep your studying on track. The quality of the instructor is the most important factor in a class. As with tutoring, you should look for an instructor who has achieved a 99% GMAT score and who gets top industry pay. The depth and quality of the course materials is also important. Other factors to consider in choosing a preparation course include cost, the frequency and total number of class meetings, and the convenience of class times and locations. As with tutoring, technological advances have made online live courses a great alternative to full-length in-person courses. An in-person class allows greater interaction with your instructor, and therefore we rank this option slightly higher than an online class. That said, online course availability significantly expands your options in selecting a GMAT preparation class. It will be much more beneficial for you to select a live GMAT course taught online by a highly-qualified GMAT instructor and that best suits your schedule and needs than whatever in-person class is geographically nearby. As an added incentive, many test preparation companies offer a lower price for online classes, since classroom rental fees aren’t incurred. Another specific benefit of an online setting is that you do not need to commute to a physical classroom, saving you commute time (often in peak traffic) and any parking fees. On the other hand, an online setting can be more distracting than a physical classroom. During class time, you must be disciplined enough to avoid the ever-present virtual temptations of e-mail, Facebook, Twitter, iTunes, and other websites. To receive maximum benefit from a live online course, select a GMAT preparation company that has invested in a top-notch online learning platform. This platform should include tools that allow student interaction with the instructor and session recording capabilities so that you can review class sessions anytime. Furthermore, be wary of online-only companies do not offer any accompanying course books from which to study. You need physical books as part of your course curriculum, because you cannot master the GMAT simply by watching course video. Finally, as with in-person classes, consider the quality of the instructor and course materials, and the number and convenience of course meetings. Online on-demand courses offer pre-recorded video lessons plus many of the same features as the more expensive online live option. The primary difference is that on-demand courses do not have the live classes taught by an instructor online at a set schedule, nor do you get session recordings of your specific class sessions. Because you are not constrained to a set course schedule, you can view on-demand lessons anytime at your convenience. We believe that the significant instructor interactivity inherent in a full-length in-person class or a live online course is worth the extra cost. A highly-skilled GMAT instructor can elaborate on the material and provide alternate explanations to ensure that you fully understand all the concepts. Furthermore, you can ask questions and solicit feedback from your instructor. Online on-demand courses, however, are a good option for students who cannot commit to a fixed class schedule. As with other online options, you must have sufficient self-discipline and focus to ensure that you can study effectively online despite the many available distractions. A weekend course condenses much of the material of a full-length course into one or two weekends. In our opinion, there is too much material to fully digest in such a short span of time. Because of the limited time available, you are unable to delve as deeply into any topic or work through as many questions as in a full-length course. Furthermore, you do not receive ongoing interaction with your instructor, nor do you have the opportunity to practice on your own in between lessons. You need high attention and energy levels to receive maximum benefit from a weekend course. A weekend course may be a good option for someone who wants in-person instruction, but is unable to commit to a full-length course or is unavailable on weekdays. A weekend course may also provide a good overview of GMAT material for someone who wants to continue with self-study after the course. You should not expect to be ready to take the GMAT after the weekend course, however. You will need extensive practice to reinforce the concepts discussed in the class. Because of the reduced hours and benefits, we believe that a weekend course should be priced lower than a full-length course. When deciding which company’s course to register for, consider the same factors as you would with a full-length in-person course. An intensive course compresses all the material and hours of a full-length course into one or two weeks, with the unrealistic expectation that you will be ready to take the GMAT upon course completion. As with a weekend course, we believe that this compressed timeframe is detrimental to the learning process. You need lots of practice over an extended period of time to reinforce the concepts discussed in class. Although an intensive course provides time for practice, you will probably be too burned out from class lectures to focus optimally on practice problems and tests. Furthermore, you cannot effectively learn so much material over a short span of time. Intensive courses are typically very expensive, as most companies charge a significant premium over the cost of their corresponding full-length courses. We would suggest an intensive course only for advanced student in very intense (80+ hours per week) jobs, such as investment banking, who can study for the GMAT only during a one week vacation from work. For everyone else, tutoring or a full-length course (whether in-person on online) is a much better option. Online tools can be relatively inexpensive compared with other preparation options, but do not provide a complete preparation solution. These tools typically consist of online practice questions and/or content videos, but lack the comprehensive structure and lessons that online courses and other preparation options have. Furthermore, online study tools do not provide written course books from which to study. Nonetheless, online study tools can be a good supplement to self-study or other preparation options. There are many different offerings available, most with a limited free trial, so evaluate carefully to find what will be best for your needs.